The Dow Jones Industrial Average and S&P 500 rose on Monday as gains in Berkshire Hathaway buoyed the broader financials sector. The Dow also climbed as Chevron shares jumped 3.7 percent to lead the energy sector higher. Chevron rose after Credit Suisse upgraded it to outperform from neutral, noting the company has a compelling free cash flow and valuation. But the Nasdaq Composite fell 0.4 percent to 7,328.85 as Apple and Amazon both fell more than 2 percent. Apple shares fell after Rosenblatt Securities downgraded Apple amid expectations of lower iPhone sales. This is Apple’s second downgrade since it released its latest quarterly report. The stock is down more than 8 percent in that time period. Amazon’s stock pulled back after President Donald Trump said the administration was looking into antitrust violations committed by the e-commerce giant. Wall Street also looked ahead to the U.S. midterm elections scheduled for Tuesday, which could send ripples throughout capital markets. Democrats are expected to regain control of the House while Republicans hold on to a slim majority in the Senate. This outcome is largely seen as positive for markets since, historically, U.S. stocks have posted solid gains during government gridlock. If the GOP maintains a majority in both chambers, it could give stocks a short-term boost as it increases the likelihood of further tax cuts. Meanwhile, a so-called Democratic sweep could pressure stocks as it could lead to a reversal of some of the policies passed by the GOP to boost the economy in the near term. The Democrats were leading with a 7 point advantage ahead of the contest, according to an NBC News/Wall Street Journal poll released Sunday. “There’s a lot of headlines that investors are going to have to sift through this week ,” said Ryan Nauman, market strategist at Informa Financial Intelligence. “With everything going on, I expect more volatility” as we get closer to the election. Investors are also grappling with uncertainty on the trade front. Stocks were hit with a wild bout of volatility during Friday’s trading session amid conflicting comments and reports on global trade. President Donald Trump’s economic advisor Larry Kudlow told CNBC there was “no massive movement to deal with China,” contradicting an earlier report that Trump had asked officials to prepare a draft for a U.S.-China trade deal. On Monday, Chinese President Xi Jinping reiterated his rhetoric against protectionism and commitment to free trade in a speech. Xi said his country was pursuing “a new round of high-standard opening up” to broaden market access to the rest of the world. 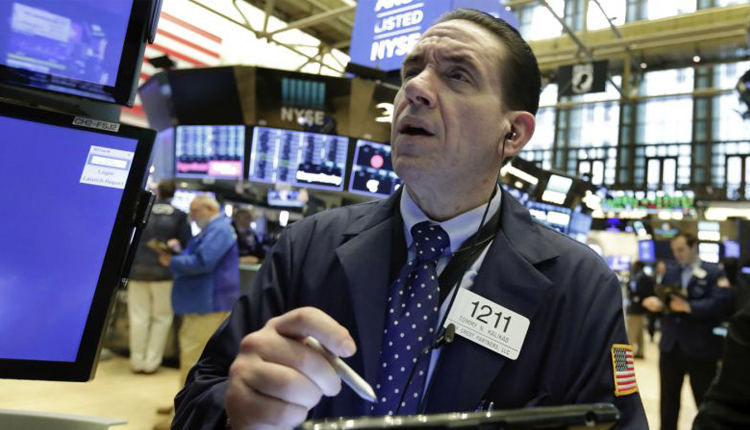 Investors have been jittery since the start of the fourth quarter as worries about rising interest rates, slowing earnings growth and lingering trade fears have dented sentiment. The Cboe Volatility index, widely considered the best gauge of fear in the market, is up more than 60 percent this quarter. “Saying farewell to a trusted friend and guardian (solid profitability) is never easy, and if the numerous challenges listed above remain while earnings disappoint, the stock market may yet have further to fall,” Paulsen said.